Crate announced a new portable guitar amp that has a USB outlet for direct computer recording. 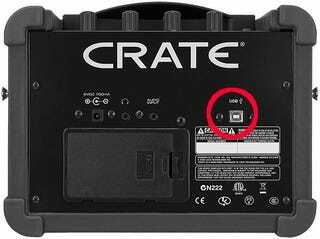 The Crate Profiler 5 seems useful for those who want to quickly record a riff without taking the time (or spending the money) to hook up a mixer or interface box. The 5 watt amp features digital effects processing and can run off 6 AA batteries or AC power. It is shipping now with a $159.99 price tag.